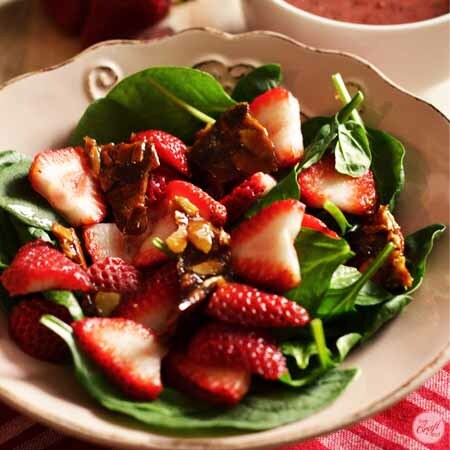 this strawberry spinach salad is sooo, sooo good. 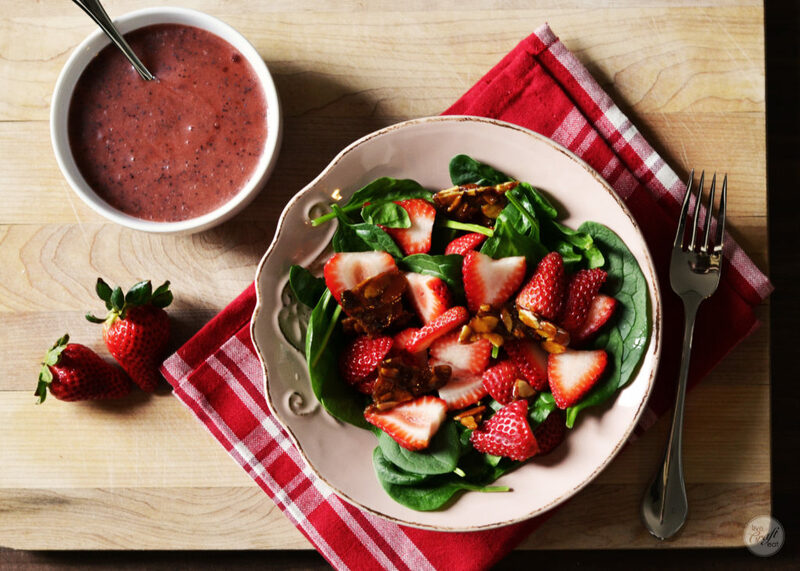 the strawberries and spinach make it taste really fresh while the candied almonds and strawberry poppy seed dressing sweeten it up just a bit. not to mention it’s really pretty and really easy to put together. all you need are strawberries, baby spinach, sliced almonds, butter, sugar, strawberry jam, poppy seeds, and oil, vinegar, and salt. 1. place spinach in a large bowl, or on a platter. top with lots of sliced strawberries. 2. make the candied almonds. 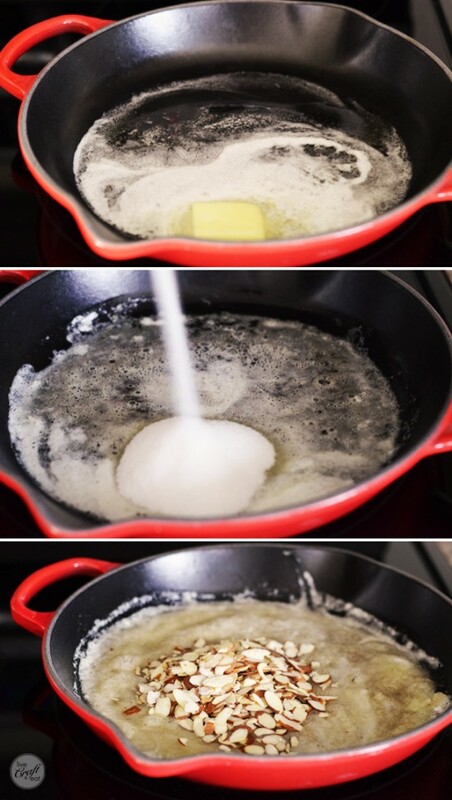 as you can see in the pictures, you just need to melt the butter and add some sugar. once the butter and sugar have started to melt together, add the almonds. watch them very carefully – the almonds can burn easily! once they’re slightly browned, pour everything onto a piece of waxed paper, placed on a rimmed baking sheet. 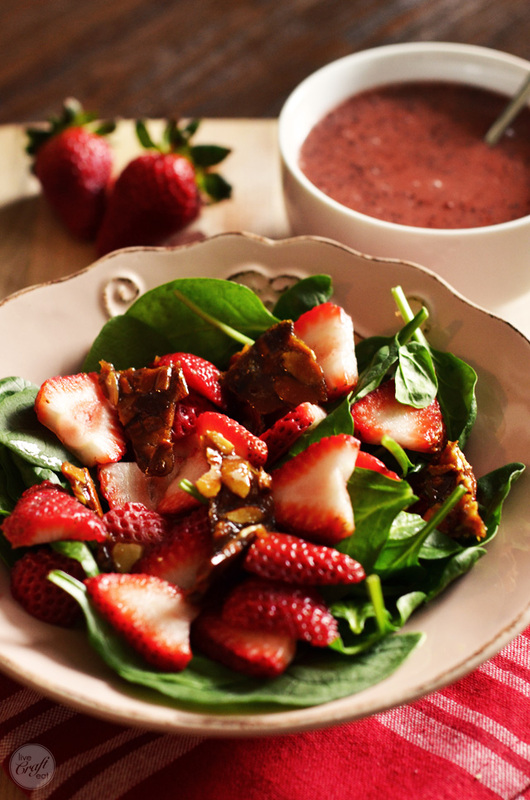 let cool and then break into pieces and place on top of strawberries and spinach. 3. to make the dressing, throw all the dressing components (listed in the recipe below) into a blender and blend! that simple! serve the dressing on the side – it will make the salad a bit soggy if you put it on all of it, so consider drizzling it on individual servings. the dressing itself, however, will keep in the fridge for about a week. this truly is a yummy salad – even my kids and husband ate their spinach! and it’s just so darn lovely, especially with all the red from the strawberries and pink from the poppy seed dressing that it would make a nice valentine’s day (or any day!) lunch. spread the spinach over a serving platter or in a bowl. top with strawberries. for candied almonds - melt the butter in a pan. add the sugar and cook until almost melted. add the almonds and stir until sugar is completely melted and almonds are lightly browned (about 5 minutes). be careful to not burn the almonds! spread onto waxed paper laid out on a rimmed baking sheet and let cool. 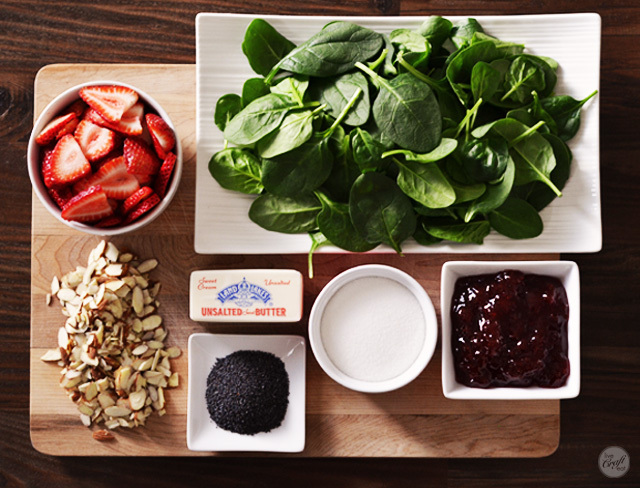 break into pieces and place on top of strawberries and spinach. for poppy seed dressing - combine all ingredients in a blender and blend until smooth. serve over salad. This looks delicious! I am planning to make it for a picnic this weekend. What kind of vinegar did you use in the dressing? Hi Heidi! I just used regular distilled white vinegar. It was sooo good! Hope you like it!